Potsdam solar array almost online. But when will solar be subsidy-free? Oct 02, 2014 — If you have driven by the airport outside Potsdam, N.Y., you could not have missed it—hundreds of solar panels gleaming in a corner by the runway. 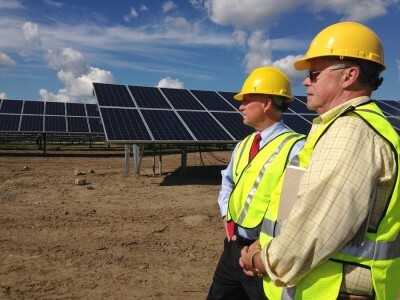 The solar array is a public-private partnership on land owned by Clarkson University. When it goes online next month, it will generate enough zero-emissions electricity to account for 10 percent of Clarkson’s power needs, equivalent to roughly 350 homes. This will be the largest solar array in N.Y.’s North Country. is not profitable on its own right now. So when will solar become self-sufficient? To find out, let’s start at the Potsdam airport, where workers are still pouring concrete to fence in this 12-acre parcel. You almost can’t see the runway because 7,700 solar panels—the same kind you’d see on the roof of a house—are in the way. They are like sculpture, shiny, wavy ribbons that follow the contour of the land. And they are almost ready to make low-carbon emissions electricity. “There are no moving parts. There’s no noise. There’s no fuel. They’re just going to sit here and produce power for 25-30 years,” said Tom Tuffy, vice-president for development for Community Energy, a private company based in Pennsylvania. Community Energy built this array for about $5 million. It cleared the project with the airport to make sure it doesn’t bother landing planes. But to make assure a return on its investment, the company needed a dedicated client—someone who promises to buy the electricity. Across New York State this year, there are 142 projects like Clarkson’s, which was approved and funded last year. Colleges, cities, and factories are partnering with developers to bring a total of 214 megawatts of new solar energy online. In the last two years, New York has installed more solar power than it did in the previous decade. But in solar energy production right now, it takes three to tango. There is one more, indispensable partner, the state. New York State, through the New York State Energy and Research Development Authority, NYSERDA, invested almost $100 million in solar power projects this year. Janet Joseph, NYSERDA’s vice-president for technology and strategic planning, said solar energy is still not cost-competitive with other sources of electricity, like natural gas and coal. If the state didn’t step in, these solar arrays probably wouldn’t exist. For example, NYSERDA gave the Clarkson-Community Energy project $1.6 million of its $5 million cost. However, the costs of producing and setting up solar arrays in New York are down by a half. Joseph said companies are asking for a smaller state subsidy now; almost 40 percent less than last year. It will take a lot of those partnerships and a lot of real, shiny arrays for New York State to take off the training wheels and set solar free in 2023.